This was taken about 2:15 in the afternoon. Normally the sky would be a clear blue, of course, and you would see hills, which are only about a mile away from my vantage point. The old play equipment, which was first installed in 1999, is being pulled out. As well, some of the trees you see in the above picture will be going. 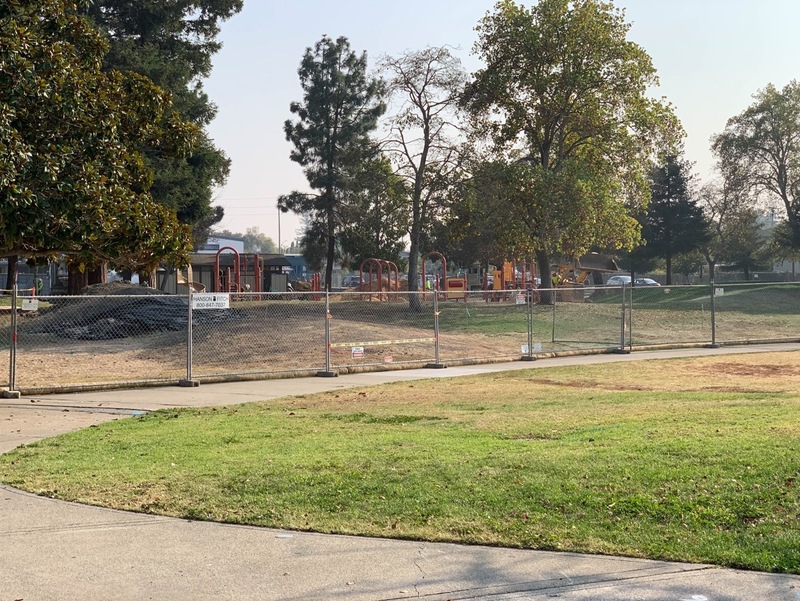 Fortunately, the new playground will sport plenty of new play equipment — equipment designed to accommodate kids and adults regardless of ability or disability — and a number of new trees. The playground is slated to open to the public late next summer, so watch for it. If you haven’t visited their flagship playground in Palo Alto (in Mitchell Park, close to the E. Charleston Road end) I recommend doing so: it really is a truly magical place. 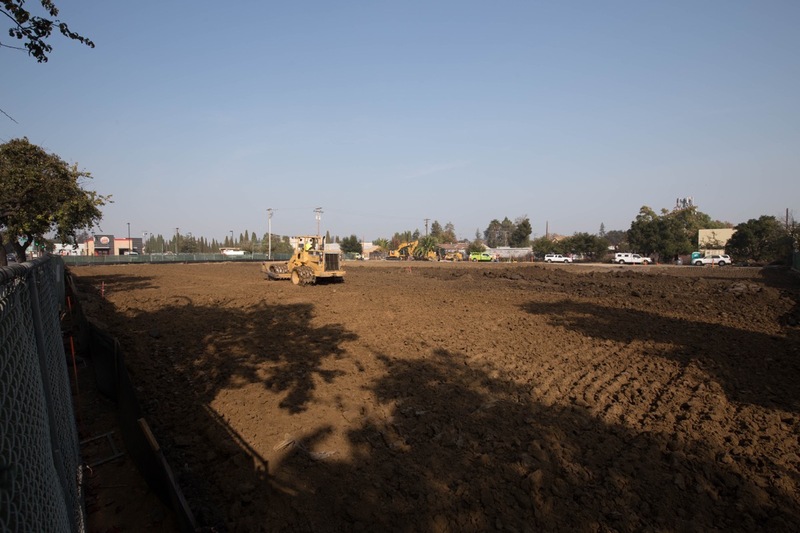 Our playground, which will be the Magical Bridge Foundation’s second, will be even larger than Palo Alto’s, and will incorporate lessons learned from that playground. I’m very excited to see what is revealed to us next summer (although naturally I’ll be keeping a close eye on the construction throughout). Some time ago I noticed a sign indicating that a portion of Redwood Creek was slated to undergo restoration, and this week I noticed that work has apparently begun. The small section between Main Street and Veterans Boulevard has largely been cleared, leaving only what I presume are native plants. In addition, a number of oak trees were planted along the creek’s bank. I was pleased to notice that it appears that these trees have dedicated irrigation, meaning that they should thrive in their new homes. I presume that the section of the creek between Bradford Street and Main Street will be done in conjunction with the 707 Bradford St. project, which will result in a 7-story, 117-unit affordable senior housing project along the creek’s bank. 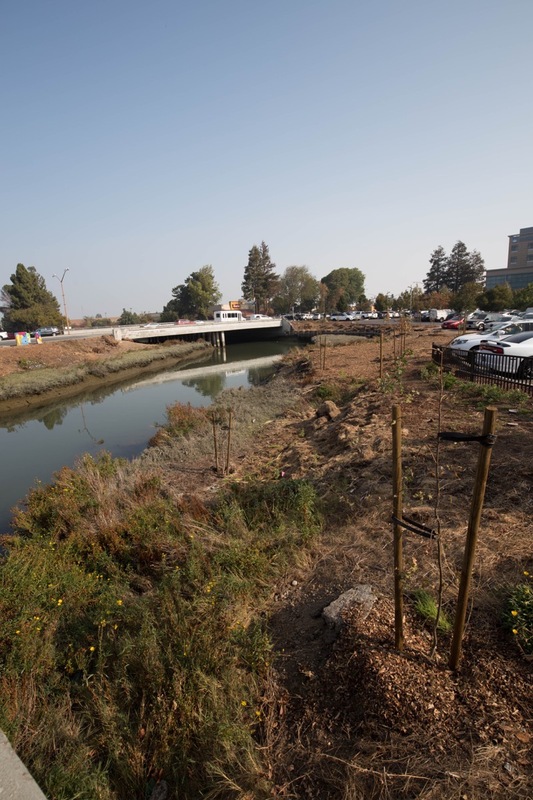 As for the largest section of the creek in this area — the section that snakes from Veterans Boulevard, then behind the old Toys ‘R Us center, and out to Highway 101, that will presumably be done later: the creek restoration project isn’t scheduled to be complete until September 2021. They’re going to need a lot of concrete once they start pouring the garage floor, and for that they’ll likely run hoses from street level down to the bottom of the garage. In any case, if you were wondering what that white tower crane over in the vicinity of Veterans Boulevard (it’s actually closer to the intersection of Marshall and Maple streets) is for, for now it is lowering loads of concrete to the bottom of what will someday be the two-level parking garage beneath MOB2. I do like how this building’s curved corner mirrors that of the Century Theaters building, just across Jefferson Avenue. It’s a nice touch. Before heading home, I headed out of downtown and over to the intersection of El Camino Real and Hopkins Avenue, where KB Home is building its 33-unit townhouse project. All traces of the former Honda dealership at that location have been wiped from the earth, and the soil is being leveled in preparation for the foundations. It doesn’t look like much, yet, but KB Home appears to be doing a nice, neat job. Hopefully this is indicative of the end product. 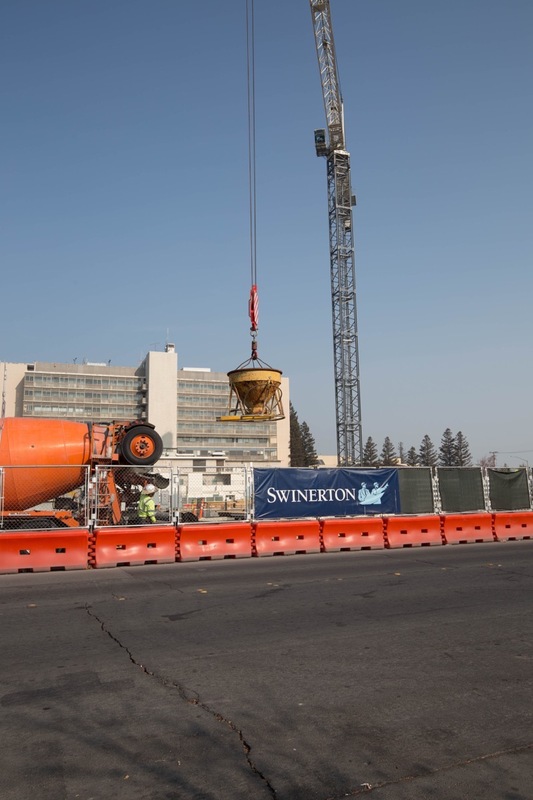 I should note that this project isn’t scheduled to be complete until Fall 2020, so expect to see the surrounding construction fences stay up for quite a while. Enough for this week. 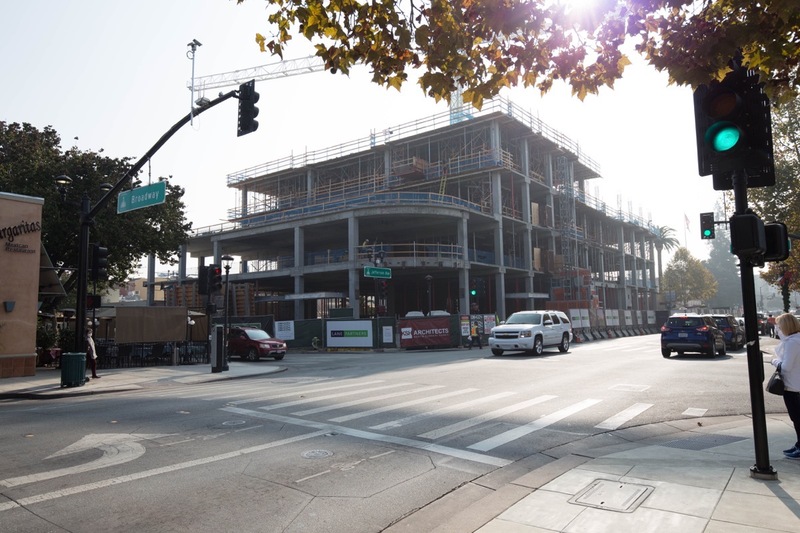 Even though the air quality here these days is pretty poor, as you can see projects around Redwood City continue to make good progress. All of that smoke, though, serves as a real reminder of the unfortunate folks up in Paradise and in surrounding areas who have been so tragically affected by the devastating fires. 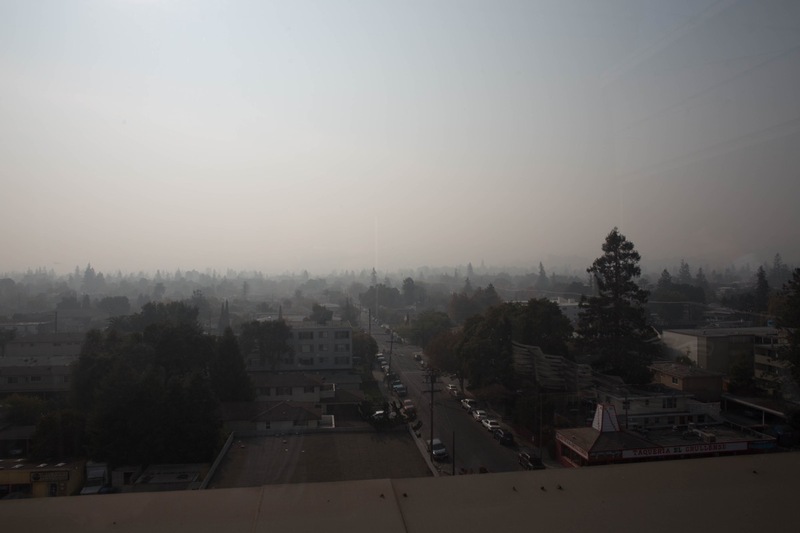 When you go outside and notice our poor air quality, take a moment and think about those unfortunate people and their suffering. What is a little bad air compared to what they have been going through?